Last night an urgent meeting was called by westside Hoboken residents after the City of Hoboken's bombshell announcement it would seek to settle with the Barry family, re: Applied and jettison 70 units from the Monarch Project into a bigger density rental building at 800 Monroe. Another group of residents planning to attend shifted going to City Hall to participate in a council subcommittee meeting on the same topic. Dozens of local residents mostly from the Metrostop building aired their grievances mostly confused why they were the victims of a real estate assault proposing another high density building without any notice to them or their neighbors. Their questions ranged from asking why this was happening to inquiry about what is possible to do with the City of Hoboken to work with the property owners David and Michael Barry. On hand offering comment and some limited but not final answers: Council members Michael Russo and Dave Mello. Russo immediately kicked off the meeting saying the council had nothing to do with the proposed settlement which came from Mayor Zimmer. He offered a number of scenarios to the residents for consideration but said a small structure was a right of the owners of 800 Monroe who may hold some rights beyond those zoning limitations. The third ward councilman said the Monarch Project should be "decoupled" from the Barry Family's property at on Monroe St. He said he would vote no on the settlement proposed for a vote rescheduled for later this month in the City Council. It's unclear what the legal basis for separating the two properties owned by Applied, re: Ironstate or the Barry family would exactly entail in Russo's proposal. Council members Michael Russo (c) and David Mello (l) in cap attended an urgent meeting of west side Hoboken residents hosted in Metrostop last night on the City proposal to see moved the Monarch Project to their neighborhood. That proposal is part of a settlement proposal the City is offering with David and Michael Barry of Applied/Ironstate who reneged on the Shipyard agreement with Hoboken to finish with tennis courts and parking. Dave Mello voiced similar concerns in response to the shock and dismay by the attendees on the City's announcement Saturday with an original vote intended for tonight, now postponed for two weeks. Councilwoman Jen Giattino, the current City Council President removed the item from the agenda only yesterday. One Hoboken resident asked where the other two votes would come from on the council to stop the City's pending agreement. They were urged to come to this evening's council meeting and voice their disapproval. Four votes will be needed to stop the City's comprehensive legal settlement among eight as Second Ward Councilwoman Tiffanie Fisher who is condo president to the Hudson Tea Building will recuse herself from participation. The audience urged to be professional and polite by one of their own at the meeting's start was only slightly mollified. One resident asked about turning the property at least partially for a Hoboken High School and others inquired on other options for a smaller condo building. Councilman Russo said the City could purchase the property from the Barrys who he called friends over years adding that he's told them they are forgetting their roots. David and Michael Barry's father and grandfather made their fortune building low and moderate income housing in Hoboken, utilizing that success as a political base where residents were expected to show up on Election Day and vote as told. David and Michael Barry's father Joseph Barry was arrested and sentenced to prison in 2004 for payments of over $114,000 in bribes to the Hudson County Executive connected to the waterfront Hoboken development the Shipyard. The City of Hoboken stated Saturday a million in litigation fees has been spent and forecast another million required in legal fees although the Monarch Project matter now before the NJ Appellate Court has been briefed. Some suggest the Saturday release by the City shows a lack of confidence in their position. Residents baffled by the sudden announcement with the original proposed vote Wednesday commented they are voters and taxpayers with some saying they had contacted the mayor and received no reply. They were urged by other resident leaders to try again while others expressed being sold out by the City of Hoboken to the waterfront property owners noting the Monarch Project as situated is in the corner of town impacting far fewer people versus being plopped down into the heart of the City. 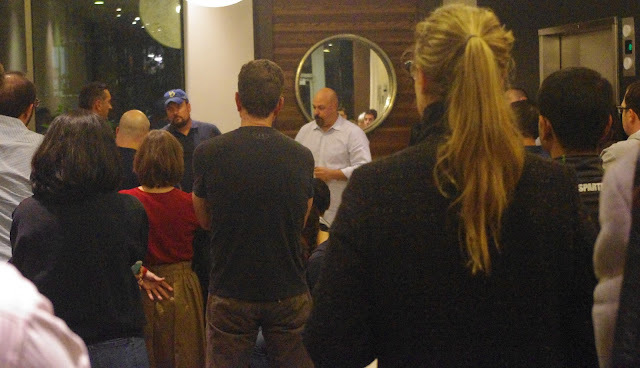 The meeting for the neighborhood hosted at MetroStop, made news last year prior to the council elections when building residents went public with their years long nightmare in Patrick Ricciardi and his kids. The municipal employee was inserted in under the Hoboken Workforce Housing program and opened the floodgates to a long list of undesirable "visitors" who trashed the building on a regular basis and disrupted residents. Ricciardi was the former IT Manager at City Hall who pled guilty after being arrested in 2011 for creating a folder automatically capturing tens of thousands of email communications coming and going to the mayor's office. Ricciardi would escape a prison sentence for those efforts and also eventually be forced to leave Metrostop after owing tens of thousands in building maintenance fees. He reportedly only paid the first one on arrival occupying a unit on the seventh floor. The City of Hoboken had lawyers fight his ejection under their Workforce Housing program while the odor of drugs, broken door locks and miscreants were given free access in and out in all areas of the building. He was finally removed from the building only several months ago and the unit remains vacant tied to the City's program. Now many residents see themselves being victimized by the City once again capitulating to a different type of criminality at the hands of the Barry family. Talking Ed Note: No small irony, one resident joining dozens of others came off the building elevator wearing a Forward Together BoE button. Mayor Zimmer has been out campaigning for the BoE slate set for Election Day next Tuesday. Councilman Russo who voiced support for big development in his council run last year said he was for smaller development last night. He noted his relationship going back some years with David and Michael Barry. The Old Guard has been closely tied to the Barry's most recently in failed efforts to elevate BoE trustee Peter Biancamano in the second ward council election last year. Biancamano refused to come out against the Barry family litigating against the City on the Monarch Project. He would later be dubbed Monarch Man by Grafix Avenger and claim at the tail end of the race he was against the project. Russo backed Biancamano's council bid and a ticket with the war cry, take Hoboken back to its days of glory and made a $2,500 loan to his failed election bid. Yesterday West Side residents created a petition under the banner HARMED - Hobokenites Against Radical & Egregious Development. In less than a day the petition has generated 322 signatures, the vast majority Hoboken residents. MSV intends to sign the petition today and urges other Hoboken residents to join doing so.